Friends Childcare has two toddler classrooms that include the following. We offer many sensory based activities such as touching, squeezing, and poking various textures and mediums such as Play-Doh, or exploring with finger paint, sand, or water. Sensory activities provide students with a range of experiences and offer opportunities to explore their environment and observe their surroundings. We believe that creativity fosters development and gives each child the opportunity to focus on the process rather than the product. The teachers implement many language and literacy activities to enhance vocabulary and speech. We believe in the importance of fostering social and emotional development through modeling, supporting and encouraging each child in the classroom, while building their self-concept and self-confidence. For further information on our curriculum, feel free to click on the links below. The toddler classrooms emphasize the importance of independence, teaching self-feed with spoons and forks, drinking from cups instead of sippy cups, and playing on their own. 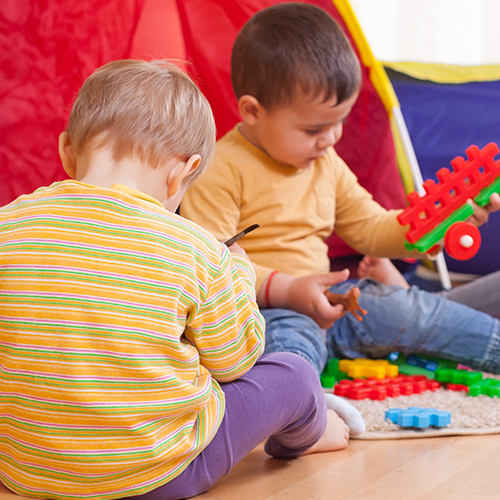 We believe it is crucial to focus on advancing each toddler's gross motor and fine motor skills by giving them the appropriate materials with which to explore, investigate, and create.